Home College Radio Day F.A.Q. 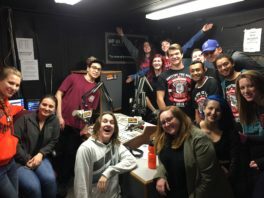 College Radio Day 2018 is Friday, October 5! Here we answer the questions we get the most from college radio stations that are interested in participating. 1. What’s the point of College Radio Day? The aim of College Radio Day is to raise the profile of college radio stations across the country and encourage increased student participation in the medium of college radio. The day is also designed to encourage people who would not normally tune into their local college radio station to do so, and hopefully stay listening because they like what they hear! Above all, the day is a celebration of college radio that reminds people, on and off campus, that college radio is still alive and kicking on many campuses across the country! Now in our 8th year, we’ve already had some great success and the backing of some great people also! 2. Who organizes College Radio Day? Who’s behind this? CRD is organized by the College Radio Foundation, a 501 (c)3 charity formed by people who work in college radio full time (advisors, and faculty). It’s an all-volunteer organization that is run by people who deeply care about the future of college radio. The founder is Dr. Rob Quicke, who is also General Manager of WPSC 88.7 FM at William Paterson University in New Jersey. Everyone involved with CRD is doing it for the love of college radio and volunteers much of their spare time to make it happen. CRD is a non-political event and invites college radio stations that are members of organizations such as IBS, CBI, BEA, CMA to unite in celebration for just one day! 3. How much does it cost to register/participate in College Radio Day? Nothing. It’s always been free to register for CRD and to participate in the day. After all, it’s OUR day to celebrate the awesomeness of college radio! 4. 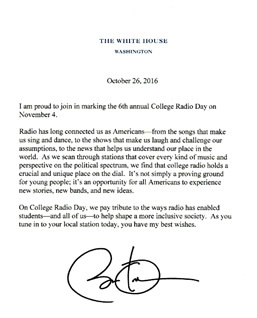 How do I register for College Radio Day? Very easy. Just visit our registration page. The registration takes just a brief moment to complete. 5. What does our station actually have to DO for College Radio Day? Anything you like. At the very least, you could download some of our sweepers and on-air material and play it during your regular programming on the day. There are also graphics and images you can download and use too. CRD does not have to interrupt or change what you normally do on that given day. At the other end, many college radio stations use the day as a vehicle to promote themselves on and off campus, and to have special concerts, BBQs, tables and giveaways, special programming, in-studio appearances by artists and bands, and a lot of very creative events. Some stations use it as a recruitment event. One station even got the local mayor to proclaim it CRD and they had a parade through the center of town! The point is that you do exactly what you want to do, but it can be a powerful event to let people in your college administration know that you are alive and kicking! Also, it’s the one day of the year that literally hundreds of college radio stations will be uniting across the country at the same time to promote the medium of college radio. 6. What are the benefits for my station participating? Beyond highlighting what you do on campus, re-energizing your students and volunteers, broadcasting some great content that we produce just for you, and reminding people that you are there, we have negotiated some really excellent benefits for stations that participate. Because we have hundreds of stations participating we are able to attract sponsors that also donate free products or offer significant discounts to participating stations. Also, if you are a participating station you are eligible to apply for one of our station grants, which are created out of the sponsorship money that we generate for the event. So there is no cost at all for your station to participate, but you could benefit tremendously by participating! 7. 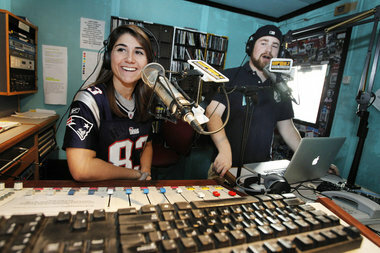 What is the deadline to sign up for College Radio Day? We will take registrations up to and even on the day itself! It’s important that you do register though, so we know how many stations are participating and so we can ensure that we can connect with stations and help give you help if you need it and the content/media for you to use if you wish to. 8. What is a Spirit of College Radio Award? Every year the CRD Task Force picks six stations that participated in CRD from across the country and awards the ones that made the most efforts to celebrate CRD a Spirit of College Radio Award, which is in the form of an engraved plaque that is then sent to the winning stations. The award is meant to recognize those stations that went above and beyond to really celebrate their station and the medium of college radio.